A funny and uplifting debut novel about stumbling through the early years of adulthood while taking (or not taking) the advice of the women who've gone before you.Dawn West is trying to make her way in New York City. She’s got an ex-boyfriend she can’t quite stop seeing, a writing career that’s gotten about as far as penning an online lawn care advice column, and a small hometown in Oregon that’s her last recourse if she can’t make next month’s rent. 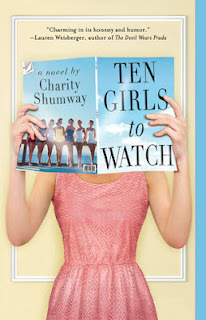 So when Dawn lands a job tracking down the past winners of Charm Magazine’s “Ten Girls to Watch” contest, she’s thrilled. Not only is she being paid to interview hundreds of fascinating women, but she’s also sharing office space with “Secret Agent Romance,” Charm’s resident dating columnist, and he just happens to be giving her butterflies. As Dawn gets to know the life stories of these former winners, she’ll discover that success, love, and friendship can be found in the most unexpected of places. And even more importantly, she’ll find that though those who have gone before us can be role models, ultimately, we each have to carve our own way. Both an insightful look at the trajectory of female experience over the past fifty years and a witty coming of age story, Ten Girls to Watch introduces an unforgettable new voice in women’s fiction.